Tulips are always a sign that spring is near! Even though we got hit with some snow (well, a blizzard) last week, spring is in the air! Fresh flowers are beginning to return to our local markets and we love seeing the perky buds and colors of daffodils, ranunculus, and tulips. As tulips begin to make their annual appearance, we can’t help but share a few tulip facts that show us how truly special they are. 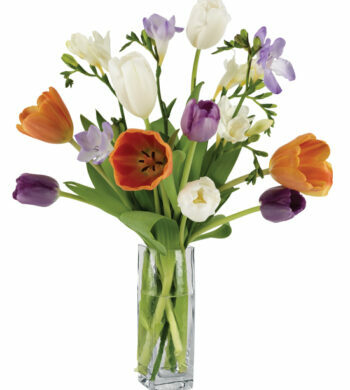 Tulips are a harbinger of spring with their heady stalks and lively blooms. Tulips are part of the Lily family which is reflected in their beautiful colors. These colors are not only beautiful but also rich in meaning. For example, red tulips with their dark center are a symbol of romantic and passionate love, yellow brings cheer, and pretty, pink tulips send a message of happiness and confidence. 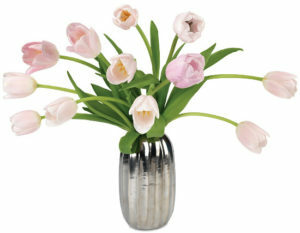 Pale pink tulips are a perfect springtime treat. 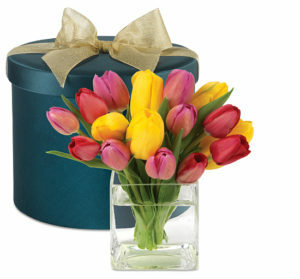 Always a popular flower around this time of year, tulips have a rich and varied history. Since the beginning of time, tulips have carried great value as they are delicate with a vast array of colors, often in just one bloom. Perhaps this is why the tulip was a symbol of abundance in the Ottoman Empire, with tulips engraved on coins, immortalized in poetry, and imbued with meaning in tarot cards. With the tulip’s distinct look, they also became quite expensive and a symbol of luxury in Europe. They even caused “Tulip Mania,” an economic crash in the 1600’s when people in the Netherlands were using tulips as trade! According to legend, tulips were valued at thousands of dollars per bulb and as the price of tulips further increased, inflation occurred. This caused an economic crash, with many losing their flower fortunes overnight. Despite this dramatic past, or perhaps because of it, tulips are celebrated and honored every spring. Maybe not in such fashion as using them as currency, but now, we can look forward to enjoying tulips in all types of ways, like the annual tulip festivals that occur as winter thaws all over the world. 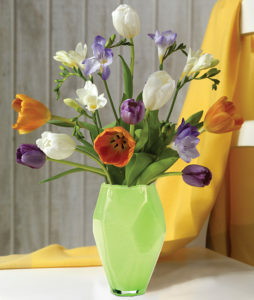 Tulips also play well with freesia and other seasonal flowers to create inspired arrangements. Flower shows are popular this time of year as the weather warms up and people are in want of inspiration as they plan for their own gardens. Tulip festivals in the U.S. began as a planting day for civic groups who wanted to beautify their communities and create an event as a kick-off to spring. And like the season itself, tulips are a transitory beauty, sometimes only blooming for about a week in the fields, making their beauty fleeting and something worth catching. And in many U.S. towns founded by Dutch settlers, like Holland, Michigan, tulip festivals began as way for the community to preserve their heritage. The festival grew to become a larger event, now dubbed Tulip Time, a festive celebration of all things tulips with dancing and entertainment. Fields and fields of tulips abound in all sorts of varieties for an awe-inspiring experience. But if you can’t make it to a tulip festival, that doesn’t mean you can’t enjoy them in your own home. 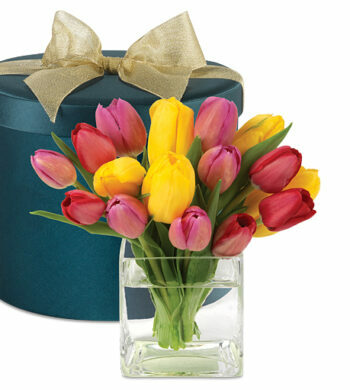 With their rich history and such a variety of colors to choose from, tulips make a great luxury floral gift as they are a lovely, springtime treat. Whether in a springtime bouquet or potted tulip plant to welcome spring, treat yourself or loved ones to tulip arrangements to brighten up the office desk or a coffee table as we eagerly anticipate the warmer weather ahead!